The Peter Parssey Memorial Award is awarded annually by the Tasmania Division to an emergency service worker who has excelled above and beyond their normal duties to help their service and their community. 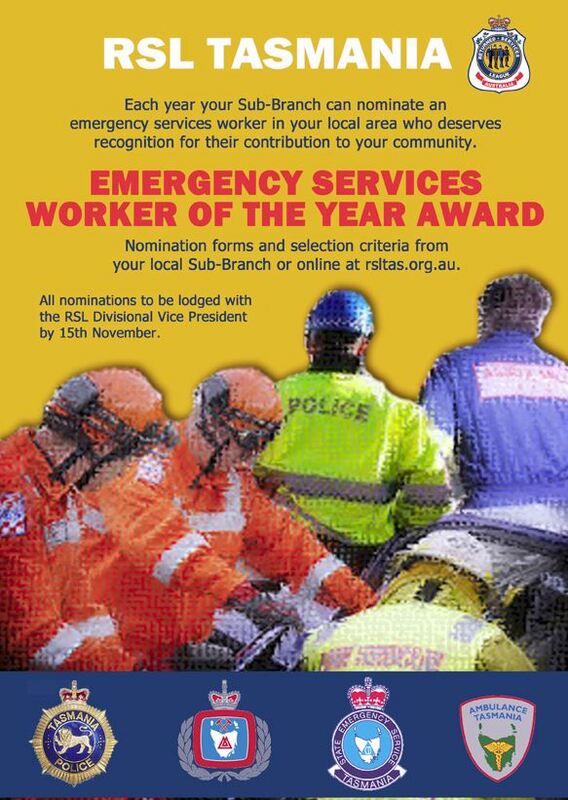 RSL (Tasmania) Branch is sponsoring an annual state wide recognition award for Tasmanian Emergency Services personnel. This award will comprise a regional award for the three regional winners to be announced on International Volunteer Day which is the 5th December each year, with the overall winner to be announced at the Australasian Institute of Emergency Service’s PJ Parssey Memorial Prize Annual Dinner in late February, early March of the following year. Each Sub Branch is requested to nominate an Emergency Services Person from their town/municipality, whom they believe would be a worthy recipient of the award. Nominations should be in line with the criteria listed below and should be forwarded to their RSL Divisional Vice President for judging. The initial judging will be conducted by the RSL Divisional Vice President and a regional representative from the Emergency Services. The details of the three finalists along with judge’s recommendations are to be forwarded to RSL State Branch where the final judging will be by the RSL State President and the President of the Australasian Institute of Emergency Services, Tasmanian Division. The regional winners will be presented with RSL plaques in recognition of their achievement at their Annual Dinner, after which the overall winner will be announced and presented with a perpetual shield in recognition of their service. As per AIES Constitution – Emergency Service Personnel means any person in professional employment with or a volunteer member of an official emergency, counter- disaster, or other service, authority, department, or organisation having official or statutory disaster or emergency responsibility, or any person in professional employment with a corporation or public company or other organisation in a position directly associated with counter-disaster, emergency planning or administration. They may not be on the front line all the time, they may work behind the scene or involved in a particular incident, shown courage and comfort in a time of need, providing welfare services or in an affiliated support role. May be a group or team effort. All nominations are to be lodged with the RSL Divisional Vice President by the 15th November each year. Judges require a summary of the nominee’s achievements and a brief description as why they should win this prestigious award. Details of the regional recipients are to be at RSL State Branch by the 1st of February each year.